organizations to unparalleled success in their lives and work. Wherever you are in life, YOU CAN experience more success. Whether it's succeeding in a career, making more money or accomplishing personal goals, you can always be more, do more and have more — and be more fulfilled as a result. Join 12 of America's top professional speakers, authors, trainers and consultants as they bring their unique talents, skills and abilities together to share their wisdom, strategies and ideas to show you How to Be a Super Achiever! Nancy's most requested keynote (See Programs page for description). Great ideas and tools for achieving peak performance, fulfillment and success. Learn how to live and work at the "Masterpiece" level. 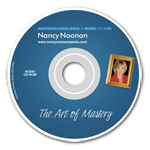 Listen to Nancy's flagship program recorded live! THE ART OF WRITING ABOUT ART is designed for ease of use and can serve as a quick reference for students writing various types of essays, research papers, exhibition reviews, or even examinations. The premise of the book is that students in all disciplines, not just English, should be required to write well and that their instructors should hold these writing assignments to high standards. THE ART OF WRITING ABOUT ART not only emphasizes skills in college-level composition, but also in verbalizing the experience of art-the historical, social, economic, and political forces that shape art and artists; art theory; and the interplay between artist and viewer.